Cell Phones & MP3 Accessories. 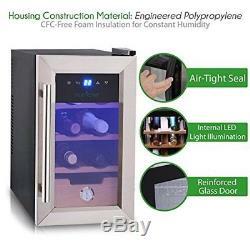 2-in-1 Wine Bottle Cellar Fridge with Cigar Cooler Humidor (6 Bottle Capacity). Brand New - Original Packaging. 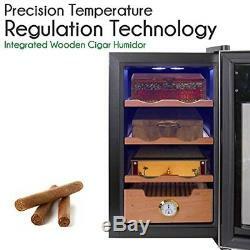 2-IN-1 WINE CELLAR CIGAR HUMIDOR: Upgraded with an integrated cigar humidor basket crafted from real wood, this digital wine cooler doubles as a cigar humidifier and wine cooler, It's the best choice for stogie-toking wine drinkers! 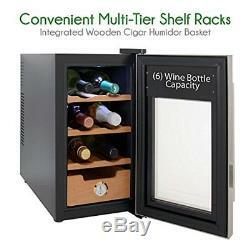 STORES BOTTLES & CIGARS: Featuring 3 wooden shelves designed to safely store 6 bottles of your favorite reds & whites or cigars + a wooden pull out humidor cigar box, our wine cooler mini fridge combo keeps the party going. 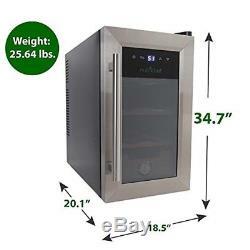 NutriChef Cigar Cooler Humidor - Thermoelectric Stainless Steel Wine & Cigar Cooler Refrigerator with Clear Glass Door - Wine Bar Fridge Combo - Humidity Control to Prevent Mold & Stale Stogies. Far from an ordinary wine cooler, this thermoelectric wine refrigerator doubles as a 6 bottle wine cooler & a humidor refrigerator. 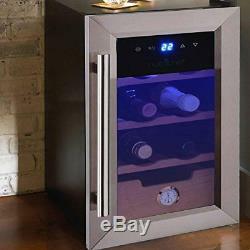 This here is the bestselling wine cooler & cigar humidor for savvy smoker/drinkers! STORES UP TO 40 2cm x 15cm CIGARS - Great for Parejo, Torpedo, Perfecto, Presidente, Corona, Robusto Stogies 6 BOTTLE CAPACITY for REDS/WHITES - Three Tiers, Each Holds 2 Standard 750mL Wine or Champagne Bottles Genuine Wood Cigar Humidor Drawer : Made out of genuine wood, the humidor box naturally absorbs moisture to keep your cigars preserved & protected from staleness & mold. 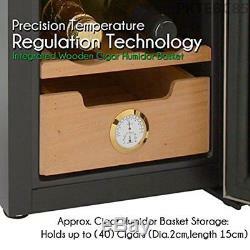 It actually prolongs the shelf life of your cigar collections! Modernized Interior LED Illumination : To bring a decorative twist to your kitchen, bar or man cave + show off your selection, we've upgraded our wine cooler humidor with high tech LED illumination. The LED lights deliver a gentle glow. Front View Analog Hygrometer Gauge : Affixed to the front panel of the built-in humidor regulator box, an analog hygrometer gauge allows you to check in on the humidity level inside without opening the glass door with air-tight seal. 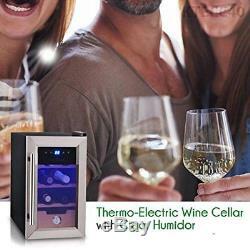 Adjustable Temp, Touch Button Controls : 41-64°F (5-18°C) Temperature Range, Wine/Cigar Enthusiast-Approved! Cigar connoisseurs & wine aficionados prefer our cigar refrigerator humidor because it's adjustable & incredibly easy to use. Fridge Cabinet Volume: 13.2 gal Dimensions: 20.1" x 18.5" x 34.7 Total Cooler Weight: 25.64 lbs Flexible 5.9' ft Power Cable Energy-Efficient Wine Fridge Our 2-in-1 cigar wine bar refrigerator is a first-class bar accessory. Bring some style & sophistication to your garage or cafe. This deal won't last long, so act now. For your convenience, have us address all your questions and concerns prior to purchasing. At Road Entertainment we do everything for assuring you a smooth and fun shopping experience. You're therefore eager to actually have it, see it, and hold it in your very hands. For heaven's sake, you want to use it, like immediately, right? APO/FPO addresses and other U. For the most part, orders will be delivered to APO/FPO addresses and U. Marking items as a gift is unlawful and US and International government regulations prohibit such behavior. We're doing our utmost to provide you with a smooth and easy return-process. Congratulations on joining our satisfied customer base, and talk to us anytime about anything in the business! Please bookmark us to your favorites list and visit often! All brand names, logos, and trademarks referenced on this site remain the property of their respective manufacturers/owners. We're not responsible for typographical or illustrative errors. All sales are subject to approval by Road Entertainment. Details about Enrock Audio Car / Marine 50 Foot Installation Speaker Wire. Details about Enrock Marine Single-DIN Car Boat Radio Dash Kit Protectors (Black / White). 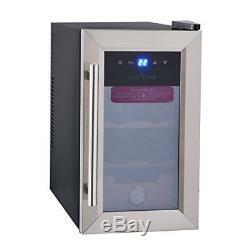 The item "2-in-1 Wine Bottle Cellar Fridge with Cigar Cooler Humidor (6 Bottle Capacity)" is in sale since Wednesday, February 14, 2018. 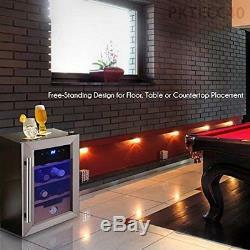 This item is in the category "Home & Garden\Kitchen, Dining & Bar\Small Kitchen Appliances\Other Small Kitchen Appliances". The seller is "roadentertainment" and is located in Newburgh, New York.